Differs slightly from the picture / description, wood had a cheaper finish and feel than expected. Holds far few less average sized cigars. The rich ebony wood has a polished wood grain finish that gives it a very antique appearance. There is an included humidifier to help maintain ideal conditions within your humidor. Easily maintain your humidifier with distilled water to keep it working properly. 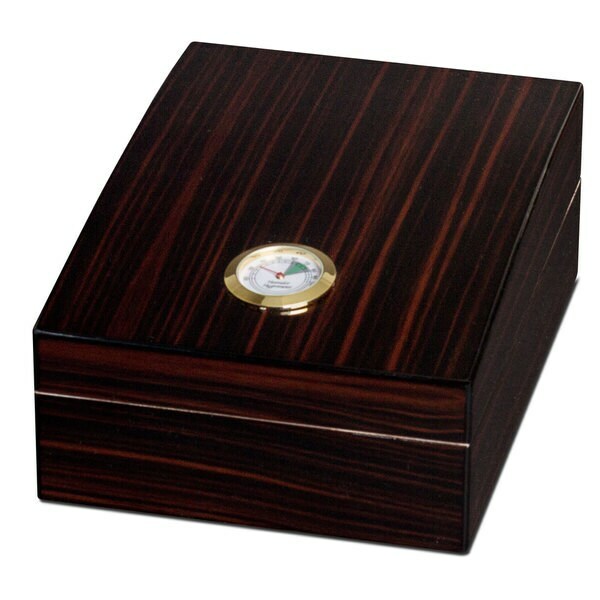 Grab this incredible humidor from Visol today. Will NOT hold 75 regular cigars! Craftmanship looks very good. High gloss, looks well made. Packaging & shipping was fantastic........... The title says it is a 75 cigar humidor. Further into the description it says it's a 25 cigar humidor :( Great if you want a small humidor....not great if you're looking for a larger one. Might hold 75 tiny cigarillos, but not regular cigars. This humidor was for a place on our bar. It needed to be eye catching...and it didn't disappoint! It holds the correct humidity and it stunning atop our bar! Looked a little unique. Plus, I am wondering if it is a 25 or 75 capacity. It states both. Actually, this is not a 75 cigar humidor. In the details of the item it states it is a 25 cigar humidor. My husband has a larger humidor but needed a smaller one for upstairs patio area and for traveling.